The richest one per cent now own half of all the wealth in the world, a new report from Credit Suisse says. The bank's Global Wealth Report 2015 marks the first time that the world's super rich have amassed enough wealth to cross that symbolic line. By the bank's reckoning, just over $250 trillion US worth of wealth has been amassed by households. At the top sit the ultra-rich, which the bank defines as having a net worth of at least $50 million in assets. Worldwide, there are 120,000 people in the group. Just below the ultra-rich are 34 million people, with a collective net worth of at least $1 million. Collectively, people in that part of the pyramid make up 0.7 per cent of the world's population, but own 45.2 per cent of the world's wealth. If you extend the cut-off to one per cent of the world's population, they own more than half of all wealth in the world. 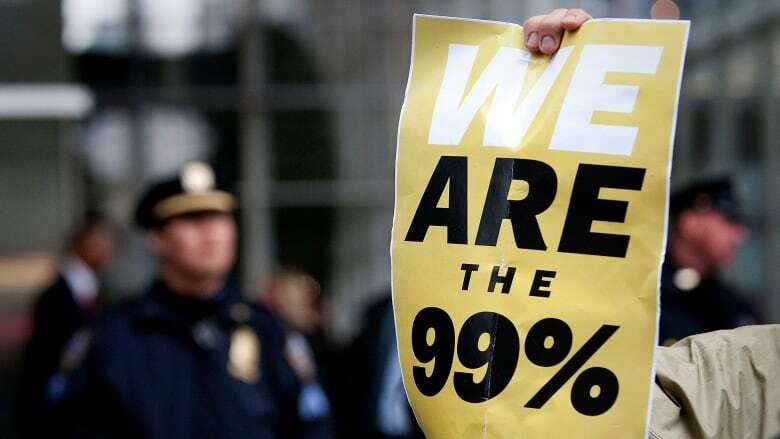 "Wealth inequality has continued to increase since 2008, with the top percentile of wealth holders now owning 50.4 per cent of all household wealth," the report said. In Canada, 1.1 million people last year fit the bill of being worth at least $1 million US. But due largely to the huge drop in the loonie, their ranks actually declined in 2015 to 984,000 people. Millionaires from just about every country saw their collective wealth decline last year, but the main factor was the rise of the U.S. dollar, which made wealth denominated in other currencies look comparatively smaller. On a global scale, Canada has a disproportionate number of millionaires as Canadians make up three per cent of the world's "1%", despite Canada having only 0.6 per cent of the world's population. Beyond tabulating the wealth of the super rich, the report examined the wealth of the so-called middle class, the definition of which changes depending on the country. In the U.S., Credit Suisse says anyone worth between $50,000 and $500,000 would be considered middle class for the purposes of the survey. In some countries, the cut-off is higher, for example, in Switzerland, where the middle class starts at $72,000. In China, it drops to $28,000. In India, it's at $13,700. Interestingly, this year marks the first time that China's middle class — numbered at 109 million according to the bank — is larger than America's, which counts for 92 million people. All in all, the middle class is worth a collective $80.7 trillion, or just under a third of the world's wealth. On the bottom rung of the global wealth pyramid are 3.4 billion adults – 71 per cent of the world's population — who are worth less than $10,000 US.